We have compiled a list of those articles which might be of interest to breeders and exhibitors of silver persians. We would like to thank PandEcats.com, the online magazine devoted to Persian & Exotic cats, for printing “Shaving Silver Noses” and “A Tour of Missionhill Cattery” in their magazine and for featuring GC, RW Missionhill Fait Accompli. The first words I said to my husband when this kitten was born were “I’ve done it!” So that is how Fait Accompli got his name. From the moment he was born I knew he would be an exceptional kitten. He was the last to be born in a litter of 5 kittens, 4 of which were show quality. Accompli is the culmination of many years of selective breeding, combining a cream CPC and a black Persian with my favorite silver lines. What is remarkable about him is that in spite of having extreme Persian type he still retains the distinctive expression of a silver Persian. He has a cobby body, a broad chest, very rounded, smooth doming with small, wide-set ears. He has a massive head with full cheeks, a deep break and a very short nose. On top of all these requisites for a good Persian, he has perfect shaded silver colorings with no tarnishing, no barring, large tear drop emerald green eyes and the whole effect is accentuated by jet black nose liner and mascara. For the first two years of his adult show career I was faced with the difficulty of showing him during the peak show season when he was out of coat. He always carried a full coat in summer and shed between October and February. In spite of this major obstacle he managed to get a regional win, but it was pretty traumatic at times. During the first half of his show career he was nervous of being on the judging table. He has now got over his stage fright and usually shows himself off very well standing like a little stallion with his head held proudly up while he is being judged. One of the best memories I have of him being judged is when a TICA Allbreed judge had him in her finals and made him Best Cat. She commented on all his good points and went on to say that when she looked into his face he was so beautiful that he made her want to cry – and then she actually started crying. Well so did I and quite a few other spectators as well! He has quite an impressive show record in CFA. He was Best Kitten, Silver and Golden Division at the CFA International Show in 1997 and Best Kitten in the Northwest Region in the 1997/98 show season. At the CFA International Show in 1998 he was 2nd Best in Silver and Golden Division. He was Best in Silver/Golden Division in the Northwest Region, 16th Best Cat, Best of Breed and Best of Color in the 1998/99 show season. Accompli has also been shown on a very limited basis in TICA. He became a Double Grand Champion in his first show, a Quadruple Grand Champion in his second show and a Supreme Grand Champion in his third show. 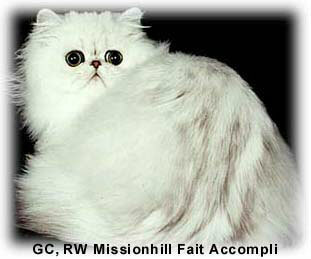 In 1998/99 he was TICA’s 12th Best Longhair Cat National, 3rd Best Persian and Silver Shaded Persian of the Year. In 1999/2000 he was TICA’s Best Silver Shaded Persian NW Region and also TICA’s Best Silver Shaded Persian National. He has been Best Cat 32 times and Best of the Best Cat in Show 5 times. Accompli is a gentle, affectionate cat. He is not very courageous and has a phobia about mice. I will share an embarrassing memory of an incident that occurred a couple of months ago. As occasionally happens, a mouse wandered into the dormitory area where my males reside and where their wives and their very young kittens lounge around. The appearance of the mouse galvanized all the cats and kittens into action. They sprang into crouch and attack mode and carefully watched the mouse as it made quick darts from run to run, hiding between the litterboxes and the PVC pipes. Now and then a female couldn’t contain herself and made a mad dash into one of the open runs causing the mouse to race into the adjacent run. During this period of frenzied activity, Fait Accompli was standing nervously over his food dish near the front of his run, watching the cats who, in turn, were watching the mouse. He had seen the mouse, but had not liked what he had seen. In fact, judging from his expression, he wished to keep himself as far removed from the mouse as possible. And then the unexpected happened… A courageous kitten made a lunge at the mouse, who shot out from behind a litter box and raced into Accompli’s run. Accompli was standing as still as a statue, not realizing what was going on behind him, when to my amazement the mouse scuttled up behind him and disappeared. It must have taken a few seconds for the awful truth to dawn on Accompli. He leapt into the air with a silent scream and I am surprised he didn’t drop dead of a heart attack. In one fluid movement he raced across his run and leapt onto his scratching post. If he was wearing a skirt I am sure he would have hitched it up above his knees. As it was he just sat on his post trembling like the proverbial leaf, with his eyes popping out of their sockets. To say my husband and I laughed, is putting it mildly. We laughed until we had tears streaming down our faces. It is this gentle nature of his that has endeared him to people and cats alike. He is popular with girls and has produced many kittens with his own good looks and gentle disposition. He trusts me implicitly to the point that he will call to me to hold a female that he is having a difficult time breeding. One of his greatest joys is traveling to cat shows where he can sit on a bed in a motel room, watch TV and socialize with the kittens that I take to shows with him. These are the precious moments that he and I share and this is one reason that he will continue to accompany me to shows when I need a companion cat for a kitten. Fait Accompli is truly a dream come true. the online magazine devoted to Persian and Exotic cats.